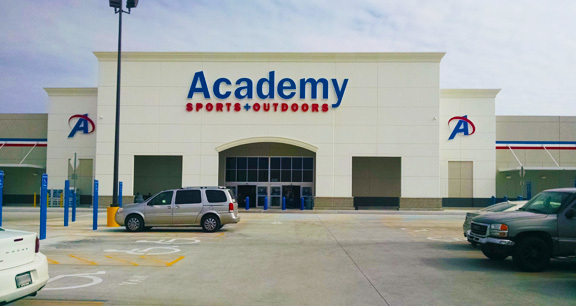 Project obstacles and solutions: In March 2014, Academy Sports and Outdoor announced its intention to build a 72,000 square foot sporting goods store with an adjacent 150,000 square foot parking lot in Evansville, Indiana. The construction of the building's floors and walls, along with the loading docks and parking lot was to be built entirely of concrete. The project was on a fast track. There was a five month schedule from the pouring of the footings to turn-key completion. To speed up the construction process, Superior Concrete was hired to build tilt-up concrete walls. Tilt-up construction forms the walls in panels at the job site and then sets them in place with a crane. This eliminates the possibility of delays in the production of precast walls and saves time in shipping. IMI worked with Superior Concrete to pace the pouring of walls and alternately pour sections of the parking lot in the same day. IMI supplied 1,500 yards of concrete for the walls and 3,000 yards for the parking lot, docks and sidewalks. Unique to this design was the use of colored concrete on the sidewalks. All of the sidewalks used imix Spectra Quarry Gray colored concrete at all of the pedestrian crosswalks and street level entrances. IMI supplied a total of 6,000 yards for this project. The store opened for business on October 17, 2014. This project won the 2014 Outstanding Concrete Award from the IRMCA. For more information on imix Spectra colored concrete, click here. For more information on tilt-up wall construction, contact your local sales representative, click here.